The Kiinde Kozii allows parents to safely and quickly warm breast milk, formula, and food in storage bags, bottles, or jars of all shapes, sizes and materials. It is the first and only warmer designed specifically to follow all guidelines set forth by the CDC (Centers for Disease Control) and the USDA (United States Department of Agriculture) to safely thaw and warm breast milk using warm, flowing water. Patent pending SAFEHeat technology allows high-speed warming using a low temperature, nutrient-safe water bath that is safe for breast milk, with a built in timer to eliminate the risk of overheating. The result is a warmer that is safer, more precise, faster and easier to use than conventional warmers which use high temperature steam that can be damaging to the antibodies and nutrients contained in breast milk. Kozii's warming chamber is designed to accommodate a full 8oz bag of frozen breast milk, and to quickly bring it to serving temperature. SAFEHeat ensures that the contents of the warmer are brought to the same temperature every time as easily as possible. 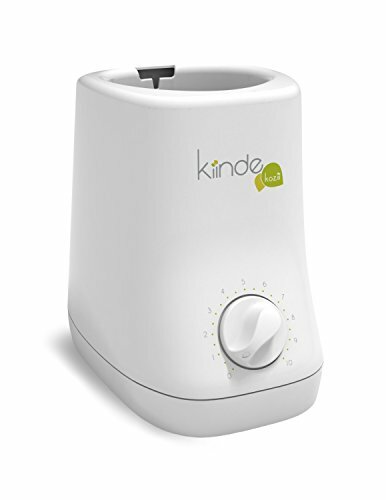 A simple, easy to read timer allows parents to set the desired warming time by simply turning the knob. When the time is up, the warming stops completely, eliminating the risk of overheating, even if the bottle or bag is left in the warmer for longer than intended. As easy as the microwave. Care instruction--Do not use scouring pads, solvents or abrasive cleaners, as these could damage kozii.